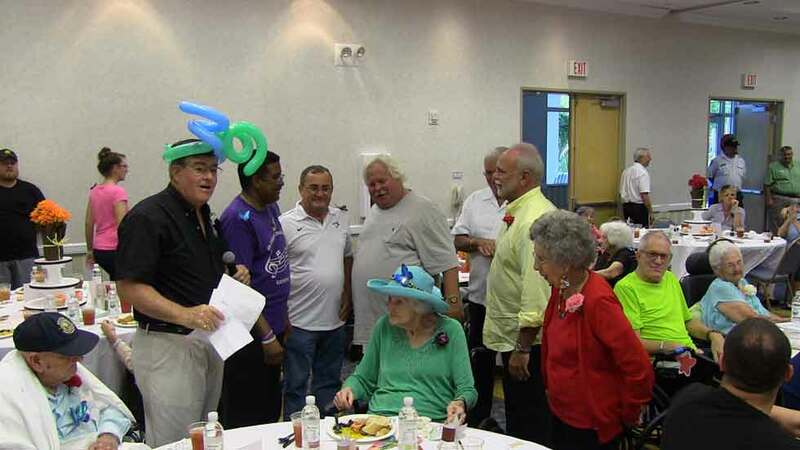 CEO Chris Belland, with Key West City Commissioners Clayton Lopez, Billy Wardlown, Mark Rossi, Key West Mayor Craig Cates and City Commissioner Tony Yaniz sing Happy Birthday to the seniors. Back in 1984, a group of folks at the Old Town Trolley thought it would be nice take the senior citizens living at Bayshore Manor out for a trolley ride and treat them to lunch. We wanted to say thanks to these amazing men and women who helped make Key West what it is today. Back in those days it was about 20 folks, members of our CAST each brought in a different dish, Burger King donated orange drink and we had a nice lunch outside in June at the McCoy Indigenous Park. This past Saturday we had over 150 seniors from Bayshore Manor, the Senior Citizen Plaza, Key West Rehab Center and the Jack Murray complex. Lunch is now a sumptuous Cuban style dinner served by the Boys Scouts of Troops 573 and 578. The Red Shawl Ladies returned with three fabulous educators donating their time to pin flowers and hand out gifts. Over 20 area business donated gift items, the Blessed Community Choir sang, the amazing Howard Livingston got everyone clapping and singing. The Mayor of Key West, Craig Cates and City Commissioners Mark Rossi, Tony Yaniz, Billy Wardlow and Clayton Lopez all came out to have lunch with the seniors. The First Lady of Key West, Cheryl Cates sang some wonderful Patsy Cline songs. Fun was had by everyone. 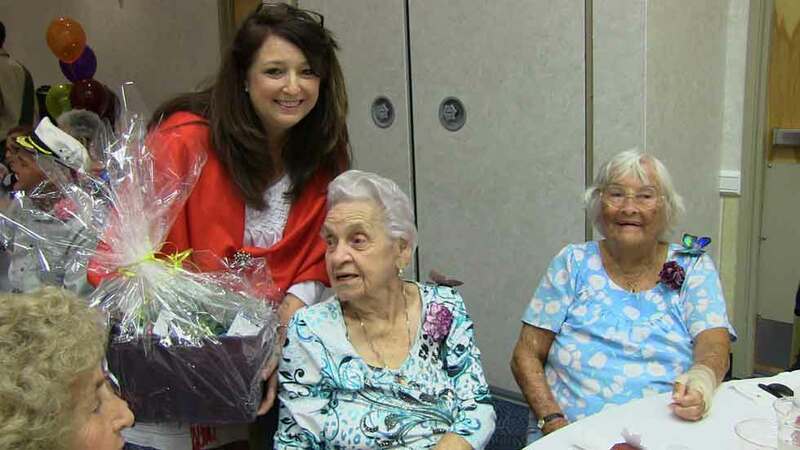 Red Shawl Lady Dawn Albury presented Edith Rodas, the oldest woman at the event at age 99 young! 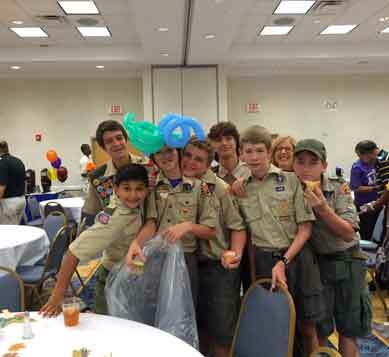 The young men of BSA Troops 573 and 578 helped serve food, assist seniors to their seats and hand out gifts. 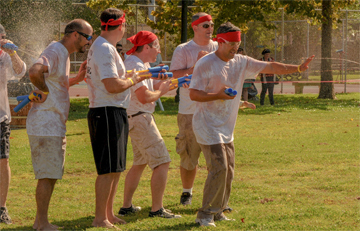 Labeled as the biggest wine fight in America, the Batalla de Vino (Battle of Wine) is a St. Augustine event where 2000 people squirt each other with red wine. All of this is done in the name of charity. Old Town Trolley Tours of St. Augustine’s hearty souls were raising money for the Wolfsan’s Children Hospital. 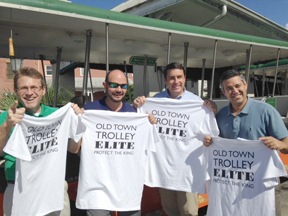 We are pleased to say not only did they have a great time, but the Old Town Trolley team placed second! …and here’s what they looked like after the battle. The American Bombshells visit Old Town Trolley Tours of Washington, DC. 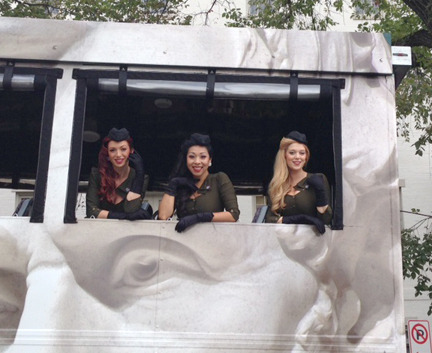 The American Bombshells aboard Old Town Trolley Tours of Washington. Old Town Trolley Tours of Washington had three remarkable ladies stop by earlier this week. The American Bombshells are a New York based group of singers who are ambassadors of America’s gratitude to our nation’s heroes. The American Bombshells have performed all over US, the world and on Fox and NBC. They are a delight to watch. Don’t take our word for it…see for yourself! Posted in , Washington DC | Comments Off on The American Bombshells visit Old Town Trolley Tours of Washington, DC. Never one to back down from a challenge, and especially one made by its sister company in Key West, Old Town Trolley Tours of Savannah pulled up their bootstraps (or in their case, but on shorts) and let the water flow! Are we the only ones to notice that GM Charlie Brazil managed to avoid the getting wet and cold? You are currently browsing the Old Town Trolley Tours Blog blog archives for September, 2014.